Mile 1766. 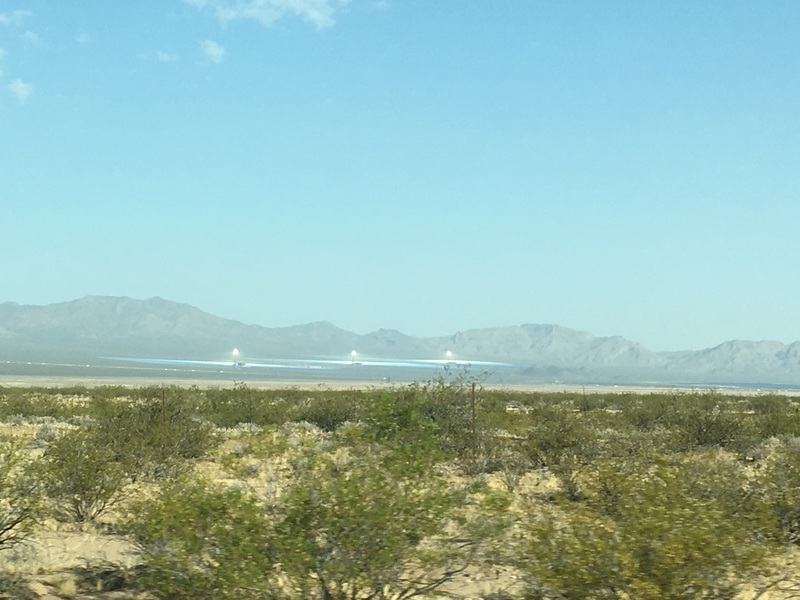 Passing Ivanpah concentrated solar power plant. The tops of the towers are painfully bright. Very interesting technology. Turns out the wind farm we passed yesterday is the largest in the US. More on both those in a minute. Mile 1771. Crossing into Nevada! Sudden burst of civilization, Las Vegas style. Mile 1825. CONDOS FOR RENT. ONE MONTH FREE! They look pretty nice, too. Bit different than Seattle. Mile 1846. 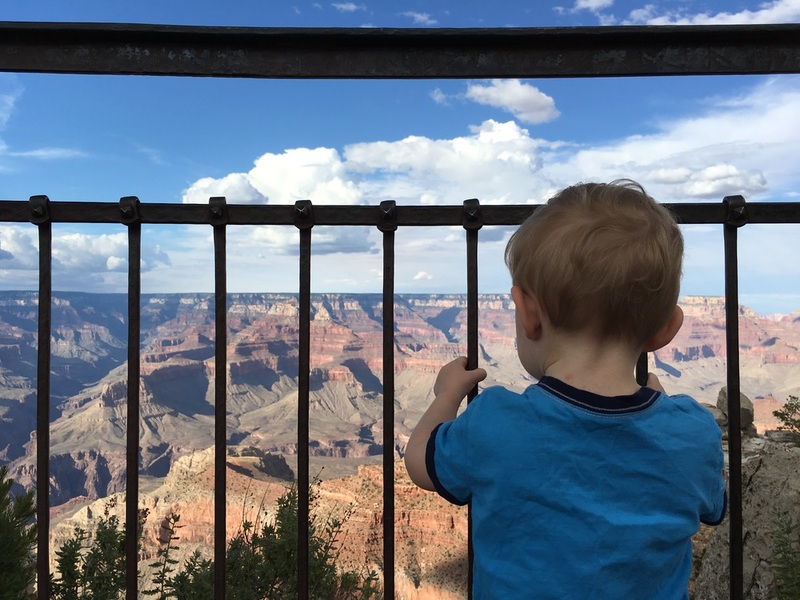 It's 100 degrees and no shade anywhere and I'm more than a little relieved that we're not allowed to take the full Hoover Dam tour with children under 8. The shorter, inside-only tour is great. Our guide has a great dry sense of humor. Shmoogie's a little nervous at the mention that we're in a tunnel carved from bedrock because apparently "bedrock" in Minecraft means you're about to hit lava and die. Everyone's a little rattled when the gigantic pipe under us roars to life, but the guide explains it's just a generator got turned on so the water started to flow. Bayboh wants up, wants down, wants a nap, wants down, wants out, wants up, wants a nap. We drive across the dam on our way to the Grand Canyon! Mile 1847. We drive back across the dam because it turns out the road out this way is closed. Mile 1851. This means we have to cross that super high bridge behind the dam. Mile 1852. The sides of the bridge are so high that you can't see out, so it's not as scary as it looks. And now we're in Arizona! And I have a minute to write a bit more about the dam. I read up on it a little before we came and had formed a sense of it as an astounding feat of engineering, but also as a compete alteration of the lower river ecosystem and a dangerous construction process that killed hundreds of workers (and reported numerous probable asphyxiations as "pneumonia" deaths to avoid paying benefits) and drew thousands of desperate families out here to the desert during the Depression in hopes of a job. The museum at the end of the tour makes some reference to the difficulty of the job and of life out here, but mostly in service of continuing to tell the heroic story of the dam controlling the "dangerous" and "destructive" river to create a "good life" in the desert for many people and irrigation for crops for many more. I'll admit to being very skeptical of dams ever since reading When the Rivers Run Dry (really really good book), but mostly I just find complicated stories more interesting than unalloyed-good stories. I think we all have a sense that power is measured in Watts. But what is a Watt? Wikipedia is probably right on this kind of thing: "The unit is defined as 1 joule per second and can be used to express the rate of energy conversion or transfer with respect to time. It has dimensions of Mass·Length2·Time−3." Reaching back to high school physics and reading some other stuff on the Internet, I'm going to think about it this way: force is measured in mass*length*time^-2, which is the same as mass times acceleration (velocity is distance/time, acceleration is increase in velocity over time, so distance/(time*time). Gravity causes acceleration of things that have mass, so when you feel the weight of a rock in your hand, you are feeling force. "Work," in the technical physics sense, is force times distance. When you lift a rock, you are doing "work" (against the force of gravity). That's how we get from the force units mass*length/(time*time) to the work units mass*length*length/(time*time). Work and energy are measured in the same units because energy does work and work can create energy. The rock you lifted now stores that work you did in lifting it as potential energy, which will be released if you drop the rock. We're really close now. (Is this simple enough my kids will get it?) Power is work or energy per time unit, which is how we get to mass*length*length/(time*time*time), which is what a Watt measures! But one more thing... because factoring out time like that isn't actually the way we use or pay for power, it makes more sense to talk about energy than power. So we multiply by time again, go back to just (time * time) in the denominator, and have a unit like gigawatt-hours (GWh). Got it? I wish I had the time and stamina to edit that further, but for now that's what I can do. The Ivanpah towers aren't expected to achieve peak generation for another year or two and I couldn't find really recent data, but the site produced 108 GWh in the first quarter of 2014. It cost $2.2 billion to build (I'm not going to hunt for maintenance costs right now) and it burns some natural gas (that is, carbon) as part of normal operations. The Alta Wind Energy Center (aka the Mojave Wind Farm) produces 2,680 GWh according to Wikipedia and I'm going to assume that's per year. So, 670 GWh per quarter on average. It looks like it cost $1.85 billion to build and I'm sure there are fossil fuel costs to its operation in repairs, bringing in equipment, that kind of thing, but there isn't any required for the actual power generation. Finally, Hoover Dam. 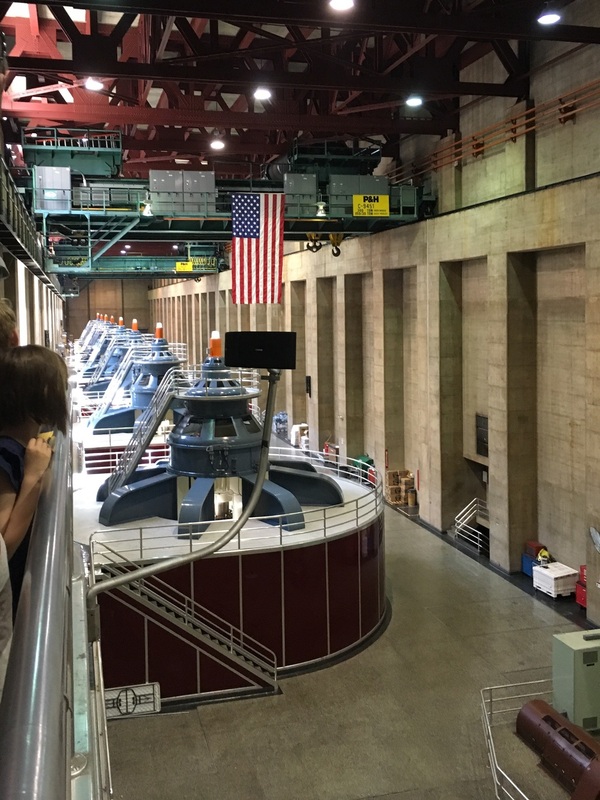 Power generation here depends on the flow of the Colorado River. Its production peaked in 1984 at 10,348 GWh and was lowest in 1956, at 2,648 GWh. Wikipedia quotes 4,200 GWh per year in recent years (I recall reading more like 3,500 GWh, but hey), so we can estimate about 1,000 GWh per quarter. And Marketplace reported it cost $750 million dollars to build in 2010 dollars. So. Stuff to think about. It looks like the wind farm produces roughly 50% (a bit more, really) what Hoover Dam produces. And the solar furnace only produces one sixth what the wind farm does. And, because I wanted to know, it looks like new electric cars are getting about 30 miles per kWh. Mile 1920. Moving the chocolate stash to the cool box. Better late than never. Mile 1999. A loud bump in the road wakes Bayboh. Mile 2030. So this is Route 66. Mile 2036. Late lunch early dinner. We are all a bit fried. Mile 2095. The Grand Canyon. Wow. It's not as scary as I had feared, although I'm definitely on alert even though the kids are being really good, unlike a bunch of other people that I'm trying not to worry about. It starts to rain and we catch the last 15 minutes of the gift shop to stamp passports and let Bayboh fall in love with a stuffed mountain lion, which he calls "cat", smiles at shyly, and hugs. Because it's just been his birthday and because so far the older kids have both gotten stuffies on the trip, we get it for him. He is very happy. Mile 2100. Driving a bit along the rim of the canyon. When a view opens up, there's a curtain of rain pouring down right in the middle, which is really far away. Mile 2218. Desert View. Wow. Wow. Storm and lightning and right at the edge of the canyon with a view of the river. Wow. Bayboh is done with all this. The snack bar here is open and has milk and cheese. Bayboh is feeling better. Mile 2186. Bayboh is asleep. The other two are claiming to be asleep and bitterly complaining any time we "wake them up" by talking quietly to each other or stopping to view a herd of mule deer grazing and crossing the road. It's nearly dark and the canyon is full of rain, you can only see the outlines of the cliffs on this side.